"This smoothie is so bright, cheerful, and delicious, it is like a blast of sunshine on even the most rainy, windy days!" 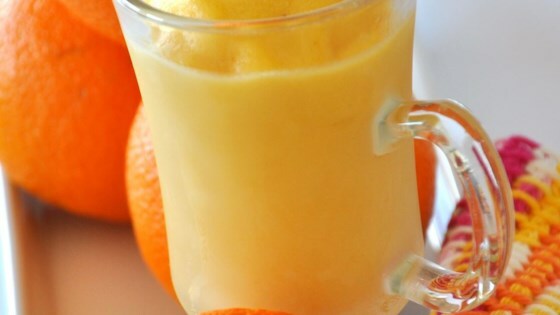 Place mango, banana, orange juice, and yogurt in a blender. Blend until smooth. Serve in clear glasses, and drink with a bendy straw! Sneak some fresh greens into your kids with this tasty smoothie. Very boring smoothie. Nothing special about this one. I did not have vanilla nonfat yogurt, I used nonfat greek yogurt and a teaspoon of pure vanilla extract. Delicious. Absolutely delicious. Oh, was this good, tho' I confess I used homemade vanilla ice cream instead of yogurt. Very tropical tasting and a pretty, pastel peachy color. Frozen mango ensured this was good and cold! Very nice smoothie. I used frozen mangoes. The kids just loved it! yum yum - the best - makes delicious popsicles, too! Very cheerful and delicious! A great excuse to buy more mangoes!